This screen shot came from a thread on MacRumors forums, although it’s not clear why many users on the same Lion build do not have this ability. Update 2: It looks like any apps installed after updating to build 11a444d can be deleted through LaunchPad, but apps installed before the recent update can not be deleted. Probably just a bug. I’m not sure how I feel about the iOSification of Mac OS X, but I have a lingering suspicion that we’ll see the two merge into iOS and iOS Pro over the course of the next few years. I like this! now will it do the same thing as lets say AppCleaner? How would it be possible that the same build number has different features? Seems weird. I’m not a fan of LaunchPad but I have fielded enough questions about uninstalling applications that I know this is a much needed feature. Click and hold until jiggle, click “x” icon, confirm with delete dialogue. Simpler for novices that are familiar with iOS undoubtedly, but I too fail to see the difficulty in deleting an application. 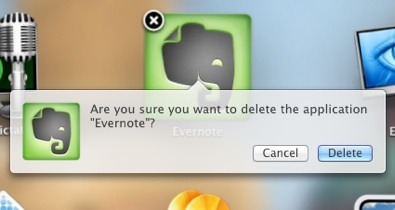 agreed, what exactly is easier than just deleting a folder? While im with the most of you saying just delete the folder, some applications leave ‘artifacts’ in say user data folders etc. Im interested in seeing if this feature will capture and slaugther all info the application has saved to my comp. And what would be eaiser then navigating to a folder? Well a simple control click actually. Any thoughts or up dates ?? ?